Dragon has delighted fans of WWII artillery with the recent 1/35 scale release of the sFH18 Howitzer. This kit marks the pinnacle of contemporary molding technology for German artillery pieces, with each Smart Kit assembly, high quality and extreme accuracy. But what good is such a fine piece of kit engineering if there is no crew to operate it? 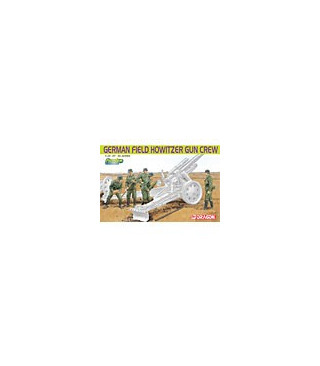 Dragon has solved this problem for modelers with the release of the German Field Howitzer Crew figure set! Always ready to meet modelers’ requests, this practical figure set from Dragon contains five crewmen purpose-designed to operate the sFH18 Howitzer. The figures are expertly sculpted in lifelike poses, and they faithfully replicate the movements of an artillery crew in action. They are ideal for a diorama scene portraying a howitzer firing against a distant enemy. The set offers more than just figures, for there are also cleanly molded accessories such as DS wicker ground mats, DS wicker ammo cases, propellant charges, ranging poles, a firing ram rod. This is a very complete set, and is a must-have for modelers wishing to populate and operate their new artillery piece!